Number : Season 16, episode 5 of 6. Which One : Giant swamp squid and the Swampies. First UK Broadcast : 23 December – 13 January 1979. Plot : Set on the third swamp moon, orbiting Delta Magna. The Doctor and Romana arrive, looking for the fifth segment of the Key-To-Time. They meet the local indigenous tribes, nicknamed “Swampies” – who worship the swamps and the coming of ‘Kroll’. Who they believe will help them be rid of a nearby chemical refinery – and it’s personnel, who they consider are desecrating the swamp. Whats good : It’s a bold attempt to make a signature Who episode. Whats bad : It doesn’t work. Review With Spoilers : The Power Of Kroll is the fifth and penultimate episode, in the Key-To-Time season and marks Who-supremo; Robert Holmes – only contribution to the series. Venturing to an unnamed swamp moon, the Doctor meets the local indigenous savages; nicknamed “Swampies”. 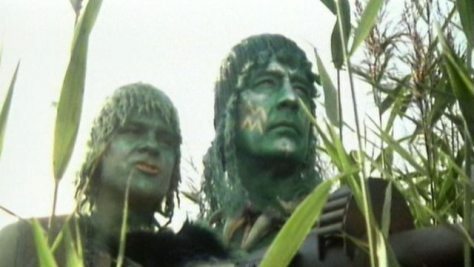 The Swampies invoke the same feel as the Sevateem from The Face Of Evil and feel just as unconvincing – well-nourished white male actors – dressing up as tribal people. A baffling and wasted turn from regular strong Who-character actor; Phillip Madoc – also features; bizarrely playing one of the secondary refinery personnel. Madoc, who impressed – so readily as the complex and unhinged Dr Soren – in Brain Of Morbius from 3 seasons prior. They should have saved him for a better episode. John Abineri from Death To The Daleks features and John Leeson (actually) appears – as himself. Probably due to K9 not being present, which was probably logistical – due to the swampy landscape outdoor set. Kroll is – in terms of Who, one of the biggest and most ambitious undertakings in the history of the show; in an attempt to feature the biggest monster in the series – so far. The special effects for Kroll are, as you would expect for old series Who – a little dated now and do detract from the scale and punch of the story. However, Kroll itself is suitably envisaged, all green and slimey with huge gaping mouth and undulating tentacles. It’s kind of funny watching Kroll go on the rampage and not only attack and destroy the refinery but also turn on it’s followers – the Swampies. The Doctor discovers that Kroll itself, is the Key-To-Time segment. The Power Of Kroll feels more of a simple bridging episode between Androids Of Tara and Armageddon Factor and doesn’t really showcase enough of a unique style to challenge for best Key-To-Time episode. With the unconvincing tribal turn, unconvincing special effects and unconvincing story. It’s no wonder that The Power Of Kroll is so scathingly referred to – as a poor episode. At least they tried though – right?